Yet another lovebird-duo has come to my attention, this time in the form of The JEALOUS Sea. Being the twee-nerd that I am (and still somewhat bitter about missing out on its glory days), I got very excited when stumbling upon this band. Their sound of jangly guitars, sweet pop melodies and cute boy-girl vocal combo really makes you think back to the twee institution that was Sarah Records. Officially formed in the spring of 2006, this boyfriend/girlfriend collaboration actually got its start several years earlier when Ronardo “Ronnie” P. Recacho had some instrumental songs that he couldn’t find much outside interest for. After re-working some of the songs as well as writing new ones with lyrics he asked girlfriend Taylor B. Crawley if she was interested in working with him, and so the ball started rolling. Combining their mutual love for indie pop and twee together with shoegaze, mod and 60’s soul- and french pop their collaboration quickly proved to be a good decision. 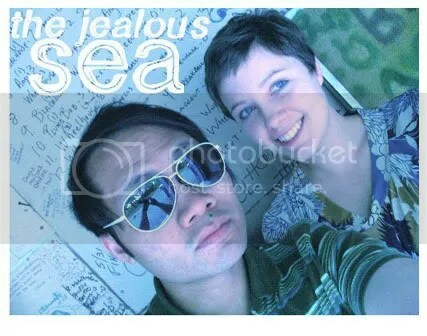 So far The JEALOUS Sea have released songs on various indie labels such as Cloudberry and Series Two Records and appeared on several compilations. Still, it’s just the beginning as Ronnie and Taylor are currently working on old as well as new songs which hopefully will be available for our listening pleasure real soon.